been found at Paluxy and sold during the Depression. A few months ago I stumbled on a little Creationist classic at a used bookstore - John Morris' Tracking Those Incredible Dinosaurs and the People Who Knew Them (1980). It is about the discovery and filming of a famous set of fossilized footprints found along the Paluxy River in Texas. Although fossilized footprints are not rare, this particular finding sparked the early years of scientific creationism in the United States. Because here, preserved in the hardened mud along the shore of the mighty Paluxy, in a layer of ancient limestone dating back to the Cretaceous, were dinosaur footprints co-existing with those of man. 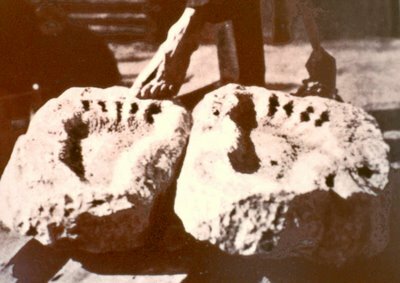 In 1938, Roland Bird, a paleontologist at the American Museum of Natural History, found for sale in a trader's shop in Gallup, New Mexico, the fossilized footprints of two humans and two dinosaurs. Bird was amazed and skeptical - these 'human' footprints were 15 inches long, and although they had five toes, he believed they must have belonged to a previously unidentified species of dinosaur. So he headed down to where the fossils had been acquired, to Glen Rose, Texas, along the Paluxy River, and proceeded to do some digging of his own. What he discovered was that the townsfolk had known about these human prints for years. Many of them claimed to have dug up perfectly-preserved human and dinosaur footprints during the depression, selling them to collectors in order to keep their farms operational. 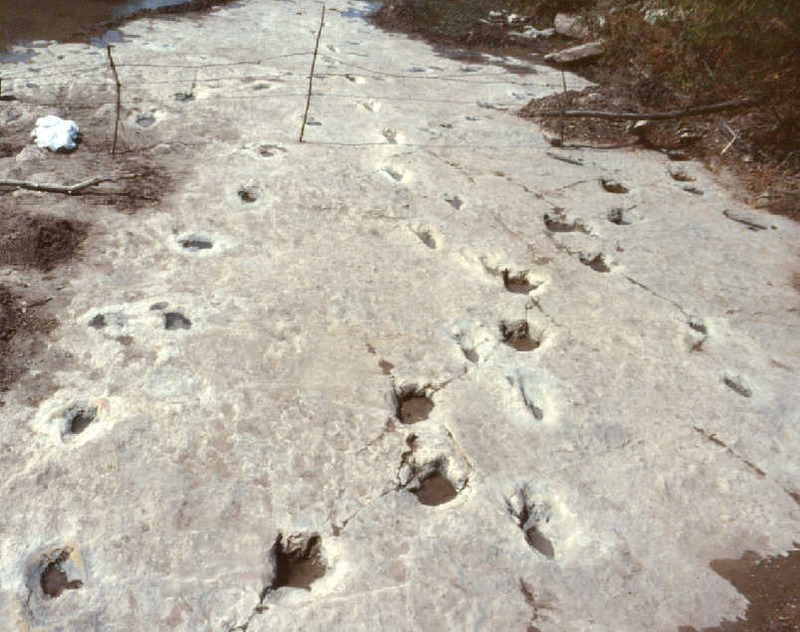 Unfortunately, the best specimens had been sold or been washed out by subsequent floods, but numerous dinosaur tracks and possible human-like tracks, whose toe prints had eroded, were still present in abundance. In the 1940s several Creation Scientists from the Society for the Study of Creation, the Deluge, and Related Sciences of Los Angeles set out to investigate Bird's published findings. Dr. Clifford Burdick published numerous articles describing these tracks, but none of them were definitively human. In 1961, John Whitcomb and Henry Morris (father of John Morris, no relation to myself so far as I can tell) wrote The Genesis Flood, the defining text for the blossoming Scientific Creationism movement. This book popularized Bird's and Burdick's discoveries, treating the Paluxy tracks as if they were definitive proof that man lived with dinosaurs, and that evolution was therefore wrong. This, in turn, led to Stan Taylor of Films for Christ going to Paluxy and filming a movie on the topic, called Footprints in Stone (1973). This film interviews locals about the footprints they had seen in the past, and shows the team of men working on uncovering more footprints. Indeed, more footprints were found. Some of the human prints were huge, upwards of 18 inches long with a stride between prints of up to six feet. Others were more reasonably sized for an adult human. The largest prints supported the Creationist view that humans had been, prior to the Flood, much larger than they currently are. The prints, in many cases, are eroded. Of course, it doesn't take long once a track is exposed before it becomes almost unrecognizable, just a few years. But at the same time there are still many that are quite good, both dinosaur tracks and what appear to be human tracks. As a matter of fact, we know of no type of animal, past or present, that could have made these tracks other than man. And there is no clear reason why man couldn't have made them. We could say, for example, that if they had been found in some more recent formation, there would be no question that they were human tracks. The main reason why some have doubted they are really man tracks is because it doesn't fit in with the accepted system. The dinosaur is supposed to have died out about 100 million years ago or so and man only appeared about a million years ago. So the evolutionary chronology and system doesn't square with the assumption that man and dinosaur lived at the same time. We feel that it is the system itself, the evolutionary uniformitarianism system of chronology, that needs to be brought under real scrutiny. 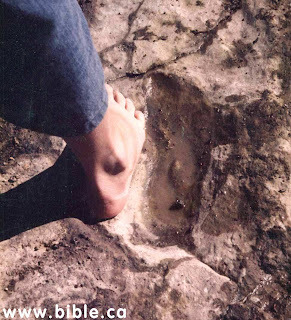 Henry Morris and many other leaders in the Creationist camp were convinced that these had to be human footprints. Henry Morris' son John went to Paluxy over many years, further documenting new finds and old tracks before they could be eroded and lost. Among the many enthusiasts to participate was local chiropractor Cecil Dougherty, whose tract Valley of the Giants was met with hostility by Films for Christ and the Institute for Creation Research for focusing solely on the large human tracks. He was, they argued, being biased. In 1975 John Morris discovered the Morris Print, the best preserved of the in situ footprints. He photographed it, but within nine months it was largely eroded. Since the release of the movie in 1971, it has been shown many hundreds of times before audiences of many kinds and a slightly secularized version has been shown in many public schools and meetings. Its effect has been incalculable. Many have been exposed to a strong case for Christianity and the reasonableness of the Christian faith through the movie...The creation movement has blossomed in recent years, and no doubt this film has played an important part. Today, Answers in Genesis (a leading Young Earth Creationist movement) has indicated that the Paluxy tracks is an argument that 'Creationists should avoid'. Why? What has happened since this incredible evidence for the Christian faith was filmed? John Morris, in 1986, six years after writing his book documenting the decades of work done by Creationists along the Paluxy River, published an article in the journal Acts & Facts, which is still presented on the Institute for Creation Research's website as the final word on the topic (http://www.icr.org/article/paluxy-river-mystery/). Over the years, however, further erosion has dramatically changed the appearance of the prints. Creationist investigators have frequently claimed that only the freshly exposed evidence need be defended--not the eroded remnants of tracks. The controversy seemed forever deadlocked, since the original nature of the prints was available for study only in photos, movies, and casts. The only way creationist claims could be invalidated was for (1) features of the prints not visible beforehand to be exposed by erosion and (2) for the testimonies of the "old timers" to be discredited. As unlikely as this may seem, just such a scenario may be taking place today.Due to an unknown cause, certain of the prints once labeled human are taking on a completely different character. The prints in the trail which I have called the "Taylor Trail," consisting of numerous readily visible elongated impressions in a left-right sequence, have changed into what appear to be tridactyl (three-toed) prints, evidently of some unidentified dinosaur...In view of these developments, none of the four trails at the Taylor site can today be regarded as unquestionably of human origin. What is particularly interesting about this is that much of the changes involved discolourations to the rock in the shape of dinosaurian toes. John Morris was not about to give up: he concludes by suggesting that someone purposefully altered the human footprints, to make them appear to be dinosaurian. Whatever the case, he regrettably stated that creationists could no longer use the Paluxy River prints as proof, at least until the cause of the mysterious changes had been determined. Morris did indeed return to Paluxy, and claimed to have new evidence for human footprints, but these prints were oddly located inside of, rather than next to, dinosaur prints. There was also a tooth discovered, which Morris hoped would prove to be a human tooth. It was not; it belonged to a fish. Despite Morris' caution, Creationists continued to go to Paluxy, as documented by Glen Chapman of the Chapman Research Group. However, the Institute for Creation Research's final opinion is that of Morris in 1986. The discoloration was either not followed up on, or was not the product of tampering. Today the Institute calls evolutionists who deride Creationism because of Paluxy as being 'twenty-five years out of date.' In fact, they now bring schoolkids to Paluxy to show them the dinosaur footprints that are there. Period. What is fascinating about this story is that he did not carve the tracks, only the prints that were sold. Creationists were so biased by their perspective that the carved prints tricked them into believing that what they were seeing in the river bed, even though some of the prints were outlandishly large, had to be human. And so the Christian message was once again tarnished, by a group of people who were trying to have the last word on a science that they simply did not understand. John Morris is still a revered Creationist speaker today - he made a mistake, and he was forgiven. If only Creationists would be so forgiving for the mistakes made by evolutionists - I'm looking at you, Piltdown Man! Great write up and a fascinating tale. I remember the foot-in-hoof creationism that I received. Well done.